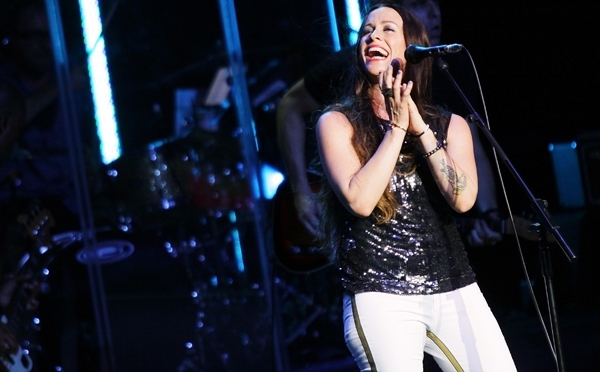 Releasing a new album is more than a good reason for Alanis Morissette to go on tour: she also enjoys the conversations new work can spark, particularly the ones she's having about Havoc and Bright Lights, her latest. "I thought they would wind up being exciting, but it's taken the philosopher in me to a whole different level," she told Rolling Stone during a 45-minute call with reporters yesterday. "So answering questions about this record, I feel like I'm in my ideal, dream-come-true seat, because I get to have a little bit of social commentary, and I'm doing it in real-time." What Morissette has learned from talking to listeners is that they are still primarily interested in how her songs relate to their own lives. "No matter how political or psychological the Q&As get, the questions always come back to relationships and most importantly, romantic ones," she said. "So it's the revaluation and re-definition, frankly, of marriage and commitment and why commitment yields healing and how art is cathartic in and of itself but it doesn't create healing. That healing comes from commitment, deep intimacy and the long term diving into relationships, especially when it's hard." Those are themes the singer explored when writing Havoc and Bright Lights. "I think it speaks to how much braver I am to delve into a deeper intimacy in my relationships, the one with my son, with my husband, even to the point where I'd be ready to get married," she said of the new record. "Intimacy was always terrifying for me, so intimacy with spirit, other people, friends, even professional colleagues. So it's a relationship record even more so than ever before." Morissette also address several big-picture topics, delving into feminism on "Woman Down," for example. It's a meaningful topic for the singer. "There really is, for me anyway, no better time to be alive as a woman than 2012," she said. "We went through the women's movement, which was an important movement, we became empowered, but in an individualistic, autonomous kind of way. Neither style, neither approach afforded any kind of connection or intimacy. And now we're slowly segueing into this gorgeous era where we're empowered but we also have the knowledge that interdependence can afford this connection within and connection with other people." "Woman Down" is already among Morissette's favorite new songs to perform – in fact, the tune is the first song on the set list for a North American tour that kicked off Monday in San Diego. "We change the set list a lot because we have the luxury of being able to do that," she said, noting that she focuses on the new album and includes "a bit of an acoustic set" toward the end of the show. "My bandmates and I want to keep ourselves on our toes," Morissette said, resulting in what she called a "super intimate" concert in San Diego. Building a set from 17 years' worth of material is partly an exercise in consensus among the musicians, the singer said. "I'll sit around with my bandmates and I look to them a lot and say 'What songs are you loving and missing harmonically?'" Morissette also takes care to cover the full range of emotions that occur in her music. "I want to make sure that I touch on enough aspects of my own humanity that it's a varied show. I'm going to keep it positive, challenging, exaltative, harrowing and have it all come forth – angry, happy, blissed out, infatuated, pissed off."